2005 MHS Calendars sold out! 2006 Calendars, featuring Montgomery buildings, now available. 1776 - Colonies declare independence from Britain. 1863 - Battle of Gettysburg (editor's great grandfather wounded!). 1885 - Louis Pasteur successfully treats a patient with a rabies vaccine. 1996 - Dolly, the worlds first cloned sheep, is born. This month I want to take a moment to talk about the Society and the Covered Bridges of Montgomery. There are five of these left standing and one in storage the Hectorville, or Gibou Bridge, in part because of Society efforts to save it. All bridges belong to the Town, and the Society has a limited role in their care. The State pays about 95% of the cost associated with repairs of the bridges considered used on highways, the Town must fund the remaining 5%. The Town must pay the entire cost of bridges removed from service. The latter is the case with the Hectorville Bridge. At present, the ball is in the Selectboard's court to determine the ultimate fate of the Hectorville Bridge. While no decisions have been made, the consensus is to repair/erect it, with as much local talent as possible, on Town-owned land (the old Gordon Jewett property) off Fuller Bridge Rd. across from the intersection of Green Mountain Rd. This will also be the site of the new municipal well and water treatment facility, and perhaps some future recreation space. The thought would be to make the Bridge part of the plan to turn this into a park/green space suitable for low impact recreation. This is very preliminary! The Society has not actively raised funds for the bridge since funding the disassembly and move, and is taking a wait-and-see approach. Earlier efforts in which the Society participated, to develop recommendations to the town failed for a variety of reasons. In general, we support any effort to repair and reassemble the bridge. Donations received by the Society for the bridge were used to pay for moving it and have been passed to the town to help pay the storage costs. This will be an expensive, time consuming, and difficult task no matter what plan is adopted or who does it. Let us, or the Selectboard, know your thoughts. The Society sponsored our community's annual remembrance. 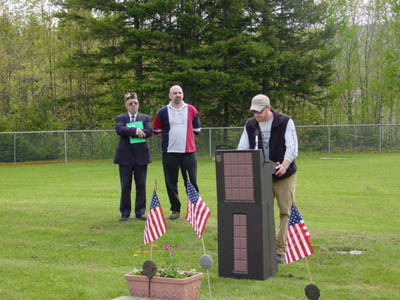 Thanks to Lindsey Larivee for singing our National Anthem, American Legion Post 42 in Enosburg for their Chaplain, Honor Guard, Firing Squad, and Taps support, and special thanks to Staff Sergeant Joshua Potvin, VT Army National Guard. Josh is a Veteran of the War on Terror, having recently completed a year of duty in Afghanistan. Also a special thanks to all MHS members who worked on this Memorial Day event. Dr. Kevin Graffagnino's, Director, VT Historical Society, May presentation on Ira Allen was superb. About 50 people learned about Allen and early Vermont in a captivating presentation. September 21st - Joe Citro, Spiritualism in VT: Religion, Politics, and the Preternatural” 7:00 p.m. Montgomery Library. Co-Sponsored with the Montgomery Town Library and Richford Historical Society. We are always looking for program suggestions. Call Charles Henderson if you've an idea. Parma Jewett led the Society's biennial participation at this summer's History Expo at the Tunbridge Fairgrounds. Our theme was "Farming: Then and Now". Thanks to Jessica Dillner for attending in period dress and demonstrating spinning. Thanks to Parma, Bill and Margaretta, and Lutz for manning the booth and to those who donated items for the display. A new event. We hoped to have local businesses sponsor mail boxes, local artists decorate them with a covered bridge theme, then display them and auction them off. We are having a bit of trouble getting this off the ground. Many businesses and artists have signed on but we need to find a builder/source of the "blank" mailboxes. We have successfully “booked” maestro Andrew Massey for a return to conduct the annual community Christmas sing along and celebration at Pratt Hall. It will be Sunday evening, December 18th. Mark your calendars and bring your voices. Charles Henderson, Bill McGroarty, and John Beaty continue work with photographer / videographer Bill Killon, and the school to develop a DVD documenting Montgomery’s bridges and the some of the oral history surrounding them. They now have a story board and hope to "shoot" this summer. This project is sponsored in part by the Vermont Historical Society, IBM, and Verizon. As of our deadline, Sabra Massey has booked the Green Mountain Barbershop Chorus for August 6th at 7:30 at Pratt Hall. Other performances are in the works. Having trouble keeping track of all of this? The MHS web site now has a calendar. We will try to keep it current and list all of our activities and events as they develop. Bill Branthoover reported two successful initiatives at the Annual Meeting, one for the records of the Nazarene Church on West Hill and the other for an extensive set of diaries from the family of Joseph Potvin. Bill said even a casual conversation can result in a donation of marvelous material and urges members to keep their antenna up for items of interest. Let him know about any possible leads. The meeting was on June 17th and attended by about 40 members. Attendees enjoyed a scrumptious meal, previewed some of this year's Tunbridge History Expo exhibit items, and received the officers' reports. All were urged to help spread the word about Society events to "share the fun". The MHS Board adopted a new fee schedule and some rules of use at the May Board meeting. Fees are May-September $150.00 member / 200.00 non-member; November-April $200.00 member / 250.00 non-member. The rules of use are available upon request and are posted to the Society web site at the Reserve Pratt Hall link. We are seeking suggestions for a snappy name for the Newsletter, e.g. "Bygone Times". Please let us know if you have any ideas and you may win a small token of our appreciation if your suggestion is adopted. Two cars went out of control on the corner in the Village and one ended up on the wheelchair ramp at Pratt Hall after going through the sign. The Board is getting estimates and will be filing a claim with our insurance company. No one was hurt and the building itself was not damaged. The driver was not insured. Last month's Mystery Photo drew an e-mail from Charles Stevens who identified the young man in the photo as his father, Rowley Stevens. Mr. Steven's had never seen that photo before and thought it was taken in front of their house in the Center rather than the farm on Hazen's Notch Road where he recalled his boyhood including haying with a dump rake. Thanks for the e-mail. Do you know these men or the circumstances surrounding this photo? Location? Please give us a call, write us a note, or send us an e-mail with your story. Thanks! We've awarded three $300 scholarships to graduating high school students this year for exceptional academic excellence and citizenship. Congratulations to Brittany DeVries, Ashley Cota, and Sara Domina. The Society normally awards a scholarship on an annual basis which is partially underwritten by bequests from the estates of Lalia Pratt Hays and Amy Booth Meyer. This year's competition was particularly stiff, as the Selection Committee noted "These are three topnotch, extraordinary young women". They are holding over, by popular demand, a spectacular historic quilt exhibit and have new special exhibits including one of toy trains. Welcome to our newest members: Olive D. Bishop, P. Bradley Conlin & Julie Carpenter, Real & Alicia Cyr, Nicholas Dill, John DuBrule &, Pamela Wiener, Scott Eagle & Abigail Crocker, Jim Esty & Pete Picard, Kenneth & Jo Anne Fiske, Jason & Heather Haddick, Howard & Kathryn King, John & Leslie Lawson, Stacy B. Manosh, Keith Miles, Montgomery Properties, Daniel Picotte, Kirsi Ulmonen & Brian McHugh, Gary Wetherbee, Therese Zartarian. January is now Vermont History and Independence Month. The observance grew out of research by a Vermont couple who found the original document declaring Vermont an independent republic in January 1777 in the National Archives. There is a link to a March news article about the new "holiday" on the Society's home page. We've added a link on our home page called "History For Sale" where folks can buy the Town History, Postcards, Ornaments, and Calendars. Perfect if you need a gift with local flavor. Our e-mail address list is up to about 37. If you would like us to include you, please e-mail the Society at pratthall@yahoo.com. The Pond Store's Michael Perry and Jeffrey Gonyaw for the perennials at Pratt Hall. D&D Deli, Beaver Meadow Nursery, D&N Nursery, Snowshoe Pub, The Pond Store, and Trout River Traders for donating gift certificates for our Annual Meeting raffle. Try saying those three times fast!